I love being a dentist! Dentistry provides me the unique opportunity to interact with, and provide care for people, in a way that can make dramatic improvements in their lives. I feel fortunate to be able to improve our patients overall health and self-esteem. With modern technology we can provide these services more comfortably than ever before. 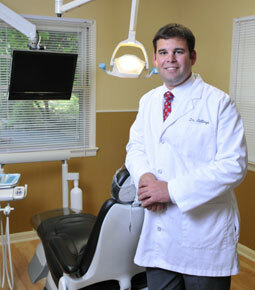 As a 2009 graduate of the University of Maryland I received training in all aspects of general dentistry to provide quality care for both adult and pediatric patients. To provide better care for my patients I am a member of many dental organizations such as the American Dental Association, Maryland State Dental Association, and the Academy of General Dentistry in addition to being an active participant in several study groups. Having been born and raised in Maryland, I have developed a passion for all that Maryland and the Chesapeake Bay has to offer. On the weekends I greatly enjoy fishing, crabbing, or just sitting on a dock. Amy grew up on the peninsula where she still resides. She graduated from South River High School in 1995 and started her career in the dental field. Amy has training and experience in all aspects of a dental practice including; dental assisting, dental lab tech, financial coordinator and as an office manager. Amy enjoys the relationships she has fostered with the patients and her bubbly nature is infectious. She is a single mother of three boys and enjoys family gatherings where they enjoy crabs, boating, jet-skiing, and vacationing in NC. Katie is an Iowa native who moved to Maryland in 2000 with her husband Mark. She graduated from Hawkeye Community College in 1990 with an Associates degree in Dental Hygiene and has been practicing full time ever since. She loves working with patients one on one and providing the best comprehensive care possible. Katie has a gentle touch and makes the appointment as relaxing as possible. She enjoys working with a wide variety of patients, including pediatric, geriatric, and those with disabilities. Kari was born and raised in Maryland and graduated from South River High School in 2003. In 2008, she received her certification as a Radiation Technologist and began her career in the dental field as an assistant. In 2012, she returned to school and received her Expanded Functions for Chairside and Orthodontics certifications. She is currently attending AACC taking classes to become a Dental Hygienist. She enjoys caring for her patients and making sure their experience in the office is calm and relaxing. Aside from her dental career, is her loving family, which consists of her boyfriend, Kenny, and their two sons, Kenneth and Kamden. When Kari is not working or tending to her family, she enjoys being around the water, scrapbooking, and relaxing. Lavonya was born and raised in Calvert County, MD. She graduated from Patuxent High School in 2005. Following graduation, she moved to Winter Park, FL to attend High-Tech Institute in Orlando, FL for their Dental Assisting program. After completing the program, she moved back to Maryland to complete her internship. She graduated from High-Tech Institute in December 2006. Since 2007, Lavonya has assisted in all areas of dentistry. She has been with South River Dental Care since 2013. Lavonya is the mother of three. She enjoys shopping, eating, traveling, and spending quality time with her family. Lavonya is currently enrolled at AACC to further her education and obtain more certifications. In the future, she hopes to further her career in the dental field as a hygienist.